The KES International Conference on Innovation in Medicine and Healthcare (KES-InMed-17) gathered a multi-disciplinary group consisting of researchers and engineers, managers, students and practitioners from the medical arena, to discuss the ways that innovation, knowledge exchange and enterprise can be applied to issues relating to medicine, surgery, healthcare and the issues of an ageing population. The central theme of the conference was Smart Medical and Healthcare Systems which covered the ways in which modern intelligent systems contribute to the solution of problems faced by healthcare and medical practitioners today, addressing the application of these systems through all of the strands of the event. The conference was part of the Smart Digital Futures 2017 multi-theme conference which groups AMSTA-17, IDT-17, IIMSS-17, InMed-17 and SEEL-17 in one venue. 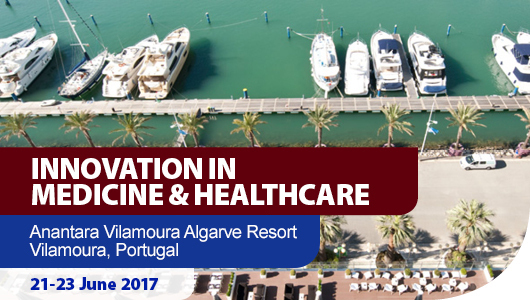 The event took place at the Anantara Vilamoura Algarve Resort.